An old (ish) boardgamer plus an 8-year-old. What to do? A couple of years ago I was introduced to Cartagena at a small games convention, and since then it has sat on my wishlist as a neat and fun little game that I’ve wanted to pick up at some point. Then a couple of weeks ago, a friend announced a bunch of games he was selling off, which included Cartagena, so I happily relieved him of part of his burden. The game of Cartagena is inspired by the story of a group of 17th Century pirates escaping from imprisonment, and has players controlling teams of pirates travelling down a twisting passageway, trying to be the first to get their whole team onto the escape boat at the end. This involves playing cards to move one of your pirates onto the next empty space marked with an icon matching the image on the card, or moving backwards to draw cards. This results in pirates leapfrogging each other forwards in sudden lurches, then staggering backwards as if, in a rum-fuelled haze, they have forgotten where they are going and what they are meant to be doing. This can get really quite tactical, but is very quick and easy to learn. I got in a bit of trouble over this game, as the first couple of times I played it, Miss B came in on me mid-game with other people, and she missed out on the opportunity to play herself. I got growled at a bit, because the game looks very nice and seems (and is) fun, so I promised to play with her at the next convenient opportunity. That opportunity arrived just a couple of days later and, thanks to Miss B having seen the game in action already, I didn’t have anything to explain to her and we were playing as soon as she had arranged the board pieces into a pleasing looking route. While the rules are extremely simple, the tactics are a little less obvious, but Miss B managed to avoid a few pitfalls that she had observed previously. In mid-game she decided that, instead of running through a passageway, the pirates were travelling down a waterlogged gutter (or something) so her pirates, being clearly superior to mine, should lie down so that they could swim. In the end, it turned out that my pirates, staying on their feet, were able to get to the boat first, and win the game, but Miss B was only a little behind. From my experience so far, I think the game really needs more than two players, but is still fun with two. I think next time we may experiment with having a “robot” player (draw a random card and move the hindmost robot pirate according to it), which should make for more opportunity to take advantage of the whole leapfrogging thing. Anyway, this is a game that has gone down well so far, and works well as a filler for adults, so I’m very happy to have it in the collection. The game: Cartagena (Winning Moves), 2 to 5 players aged 8+. Let’s get this out of the way without any mucking about: Get Bit! is a very silly game. 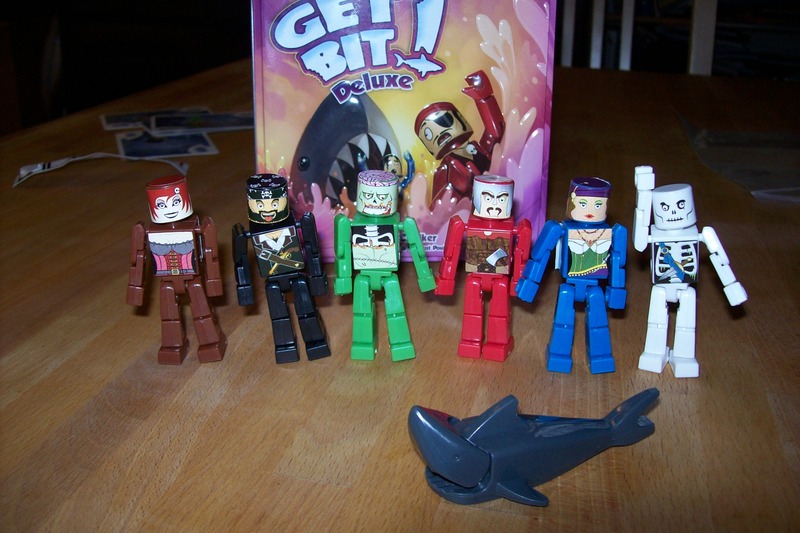 Depending on the version you own, you have a bunch of robots, pirates, robot pirates, or whatever, all being pursued through the water by a shark which periodically bites a limb off whomever is closest to it. And you actually have little robot figures which you pull the arms and legs off to indicate their state of incapacity. This is very silly indeed. Looks like blue’s full complement of limbs is about to get depleted. The set we have is Get Bit! Deluxe, which comes in a nice tin and has stickers that you attach to the robots to turn them into pirates (though there are also stickers for a skeleton, a zombie, Cthulhu, and a panda), which turns the first play into a craft project, one which Miss B and I enjoyed greatly. 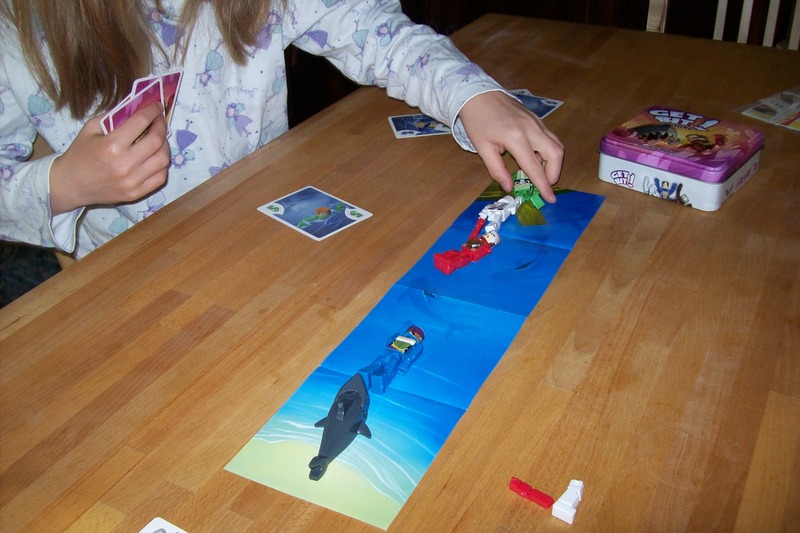 So, to play, you set up the robots in a line with the shark (yup, there’s a little toy shark too) at the end, then everyone plays a numbered card from their hand. Robots are then shunted to the front in order of their card number, but only if nobody else has picked the same number. This can, frankly, be hysterical as you watch your poor robo-pirate slipping back through the line with nothing you can do about it but get bit. Bitten. Whatever. We just had to include a gallery of our heroes. There were plenty more decoration options we could have chosen. I was a little concerned that Miss B wouldn’t like the dismembering aspects of the game but I needn’t have worried. The pirates aren’t real, of course, and being allowed to dismantle toys as part of a game is a definite bonus. We just played the game with two of us, which was a little unwieldy as we had two robots each, but it just meant that we had to choose two different coloured cards from our hands each turn. No problem, we got the hang of that. And the time Miss B accidentally chose two cards of the same value (thus preventing both her robots from moving) didn’t turn into an issue, and in fact was funny when it transpired that this ended up in one of my robots losing a limb after all. We’ve since played a three-player game with S joining us, and this was also quick and fun. I think we have another winner here. The game: Get Bit! 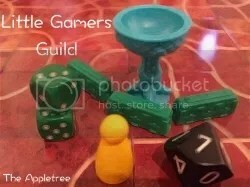 (Mayday Games), 2 to 6 players (it says 3 to 6 on the tin but gives rules for 2) aged 7+. Look out for the socktopus! A couple of months or so back, a conversation with Miss B resulted in her deciding that she wanted to make her own pirate game. We brainstormed a bit and came up with some ideas. There was going to be a board for moving ships around on and finding gold, and you would play cards to make things happen. So we set to making some cards by writing on and illustrating some blank cards. That was about as far as we got for some time, though Miss B occasionally made a few more cards to add to the set until we had a couple of dozen cards including loads of “sailing” cards for moving your ship, as well as cards for battles, repairs, exploration and going on treasure hunts. This weekend, however, we finally got a bit further. We drew a load of circles onto a large sheet of paper, with the circles connected with arrows to indicate the prevailing winds. Miss B then illustrated the board by drawing the pirate islands and adding decorative fish and a socktopus (if you need to ask…). We got out some counters, a die and a pile of plastic gold coins, discussed the rules that we would use and gave it a go. The aim of the game was to collect a certain amount of gold and part way through the game it became apparent that the flow of gold onto the board was way too slow, so we had a bit of a discussion, knocked up a couple of extra cards to improve this, shuffled them into the deck and resumed. A few minutes later Miss B won with me having been unable to collect any gold myself, thus highlighting the dearth of cards allowing you to collect gold. We made another small change to a few cards for use next time, hopefully remedying this. So far this has been a very positive experience and Miss B is even more enthusiastic about the project than before. At her insistence we spent a little time together afterwards formalising and writing up the rules we had used, which will form a basis for future plays. I think we’ll be making a few more cards and playing a good few more times in the near future. I mean, there are pirates in this version of the game. Surely that’s enough? Actually, my early impressions of the game are great. The basic mechanics of the game are almost identical to the original Settlers, but trading has been tweaked (so you trade with a non-player market or the bank), resource cards have been replaced by gorgeous tokens (though the design of the gold counters leaves something to be desired) and the development cards are now “Coco the parrot” tiles which do something good for you when you buy them. We’ve played this a couple of times so far, with three and two players, and both worked well. Actually, during our first play I rushed reading the rules and we ended up playing with unlimited trading and no bonus for collecting parrots. This actually worked out quite fun, mind, but we have shifted to the proper rules now. The game zips along quite quickly, even with Miss B getting distracted and singing a song or chatting about the fact she doesn’t think there should be as much wood as it isn’t as interesting as goats. In some ways I think this is actually better than the original Settlers. It is certainly less likely that someone makes a poor or unlucky start and never recovers. This could really turn into a very good gateway game which I’d be more than happy to play with an adult group. I think the “Junior” label is a bit unfortunate as it makes the game sound like more of a kids’ game rather than the great little family game it actually is. 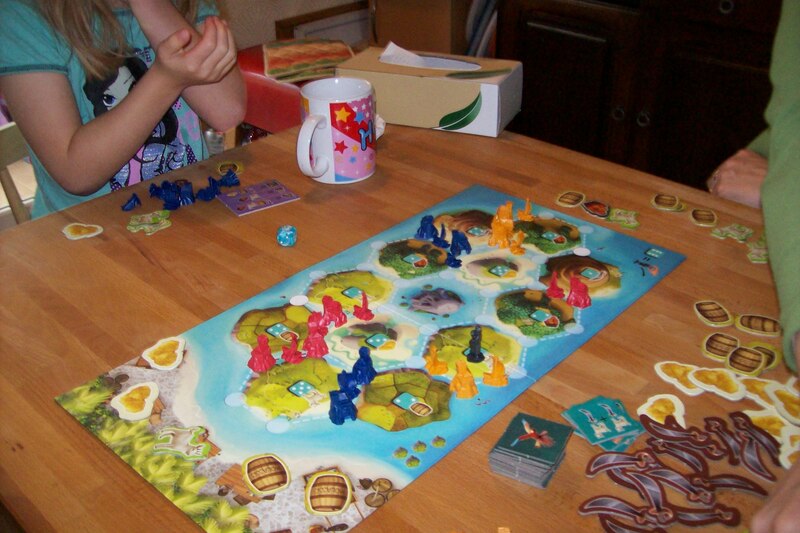 The game: Catan Junior (Mayfair Games), 2 to 4 players, aged 6+. No, poppet, it’s a merchant ship, not a battleship! Everyone likes pirates, right? So Loot, a pirate themed card game looks to be a winner. With Miss B armed with her new card holder (more on that another time, I’m sure) I dealt out the cards, explained the basics of the rules and we were off. This is a really simple trick-taking sort of game, where you pile pirate ships onto merchant ships until you have the strongest attackers, at which point you capture the ship and take the gold. Challenges involve playing the right colour pirates at the right time, and counting up the number of skulls on the pirate ships to determine the strength of an attack. Oh, and playing the Admiral at the right time. All of these were overcome and after a couple of plays, B is playing confidently without much help. So far we have only played this as a two-player game and it is proving a lot of fun for Miss B, and pretty OK for me — the pattern of play tends to involve a few battles, then a few turns of drawing cards, then a couple more battles, and so on. I suspect that with another player or two this would liven up a lot as you would have more choices each turn. I’ll see if we can rope Mummy in some time. It’s also worth knowing that we use the full rule set when we play, so I think the 10+ recommended age is rather over the top. 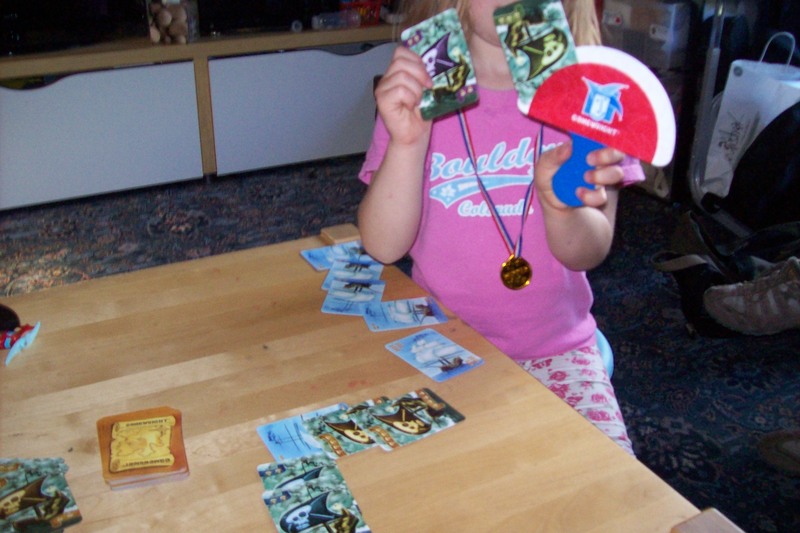 The verdict from Miss B (aged 4½): “That’s really really good, but I don’t think I like the pirate captains.” A couple of plays later and she has changed her mind on the captains, which make the game much more exciting, apparently. 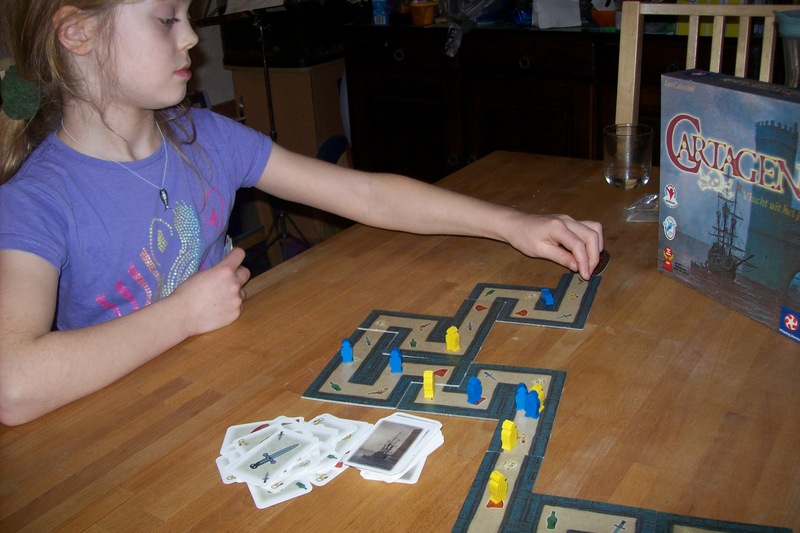 The game: Loot (Gamewright), 2 to 8 players, age 10+. Nur ne nur nur, ghosts don’t scare me… Eek! Look, the hand is the same size as my hand!